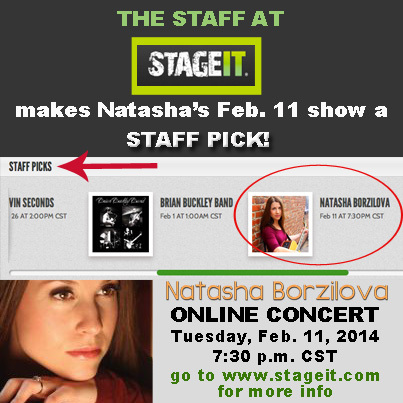 Natasha’s upcoming live online concert via the Stageit platform has been listed as a “Staff Pick” on the Stageit website. Only 50 tickets being offered for this show! The Independent Music Show is a syndicated radio show featured on 200 plus stations worldwide and hosted by Tom Lambert. 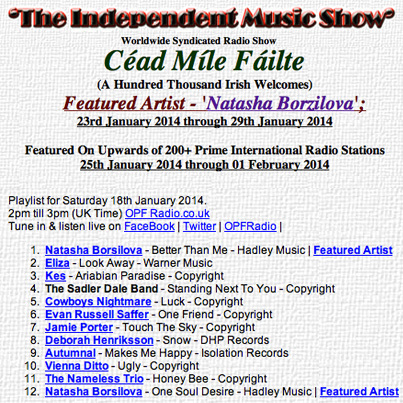 Natasha has been chosen as the featured artist from January 25 – February 1, 2014 on the college underground show. After the show airs, it can be heard as a podcast here. They also set up a full page on their website about Natasha with images, links and videos. The playlist included two songs from Natasha’s Out of My Hands CD. Nashville music personality Billy Block has been diagnosed with stage 4 Metastatic Melanoma. 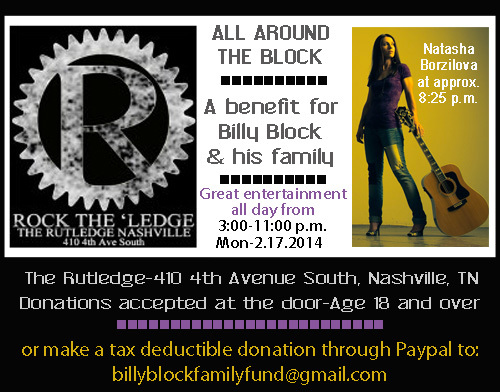 Block has been an advocate for many underdog artists giving them exposure on his shows around Nashville for 17 years and now the Nashville music community is giving back with an all day benefit at The Rutledge on Monday, February 17, 2014. Natasha is pleased to have been invited to be a small part of the day and will be performing two songs at approximately 8:25 p.m. so if you are planning to stop by to show Billy your support and are a fan of Natasha, you may want to make that the time you come by. Read more about Billy Block here. 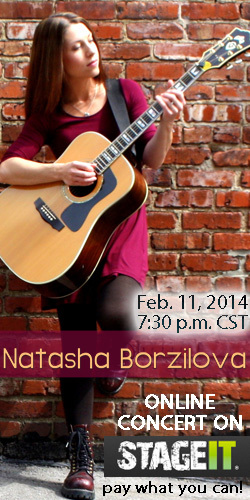 Natasha to do first Stageit Online Concert! 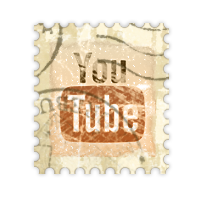 Stageit online concerts are a new and exciting way for an artist to bring their live performance to fans in areas they are not touring in person and Natasha plans to do just that in 2014. Because she is the mother of two small children and touring extensively can be a challenge, she has decided to bring some shows directly into your living room for you to watch on your laptop. 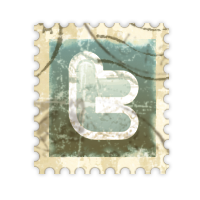 The first show will be on Tuesday evening, February 11, 2014 at 7:30 p.m. central time. It will be streamed live from Catch This Music studios on Music Row in Nashville with high definition cameras making the experience one of high quality from a visual and audio standpoint. People who want to watch the show can tune in online through the Stageit platform for as little as 10 cents! Then, tune in on the night of the show, sit back and enjoy yourself. Many viewers hook up headphones of connect the laptop to large speakers. 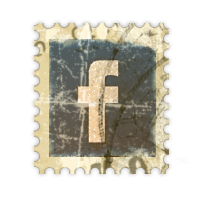 Some people invite friends into their home and watch on their TV screen online. You can chat with other viewers watching and even ask Natasha questions through a moderator. It’s a totally unique and wonderful experience for a music concert! 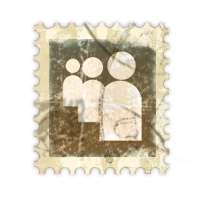 Click HERE to buy your ticket now! This past year, Natasha took some time to reflect on how she might want to present her music differently in a live setting yet still be able to tour as a solo artist. Her answer was to incorporate a Boss RC-300 Loop Station into her performances. 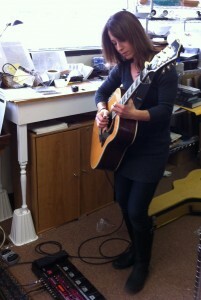 The Loop Station allows her to build tracks of different guitar parts, live, as the performance is happening and continue adding and building into a fuller sound. It also allows her to play lead guitar parts over her rhythm guitar tracks. Just to be clear, she is not playing to pre-recorded tracks. On each show, she begins playing and recording the parts and then weaving the parts in and out of the song by using the foot pedals. It is a complex process which requires great mental and physical coordination and required her to “learn to play all over again” as she put it. She is now ready to take her new show into venues so stay tuned to her schedule as it will be taking shape.